The golden brown pelage of Bohor reedbucks is typically shaggy and oily. The undersides are white. There are few notable markings: many populations have a dark stripe on the front of each foreleg, and there may be a pale ring of hair around the eyes and along lips, lower jaw, and upper throat. Males are readily distinguished from females by their thick necks and a pair of horns. The horns tend to be short and stout, extending backward from the forehead before hooking sharply inwards and forwards at the tips. However, some individuals from Sudan (R. r. cottoni) have very long, wide-spreading horns. Typical horn length is 25-35 cm. 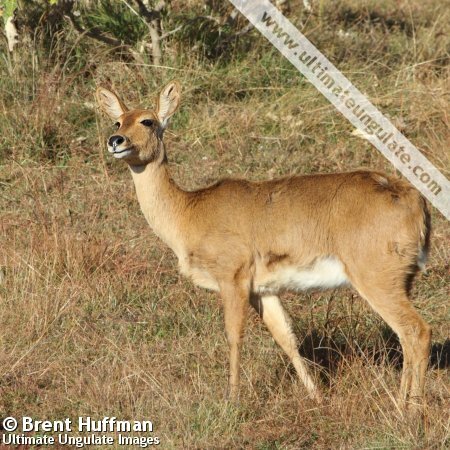 The southern reedbuck (Redunca arundinum) is larger, slenderer, and less intensely colored. 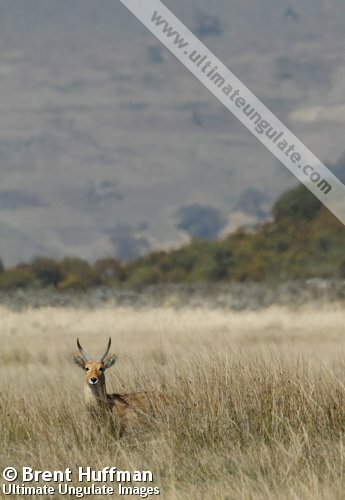 The horns of male southern reedbuck are longer and have a gentle curve (they lack a distinct hook at the tips). 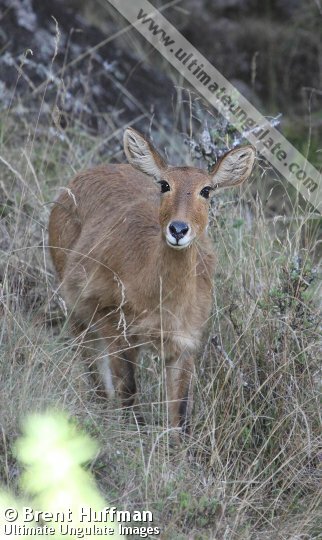 Mountain reedbuck (Redunca fulvorufula) are rather gray in color. 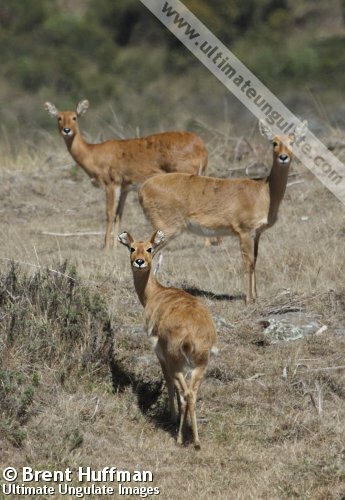 Their body size and horn length are both much smaller than in the bohor reedbuck. Gestation period: Estimated to be 7-8 months. Sexual maturity: Females at approximately 1 year; males are not fully mature until 3-4 years. Life span: At least 10 years. For the first few months after birth, young reedbucks remain hidden in dense vegetation. This habit make determining birth seasonality a challenge; it appears that the species breeds year round in eastern Africa, but with fewer births during the dry season. 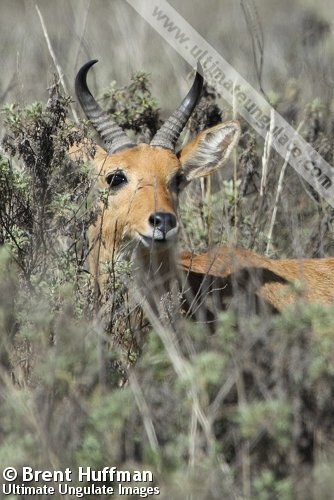 Bohor reedbucks are active throughout the day and night, but often rest in long grass during midday. When threatened, they usually remain motionless or retreat slowly into cover, only fleeing once the threat is very close. The alarm call is a shrill whistle. Adult males maintain territories 0�2�0�3 km2 in size, enforcing the boundaries through patrols and displays instead of marking them. 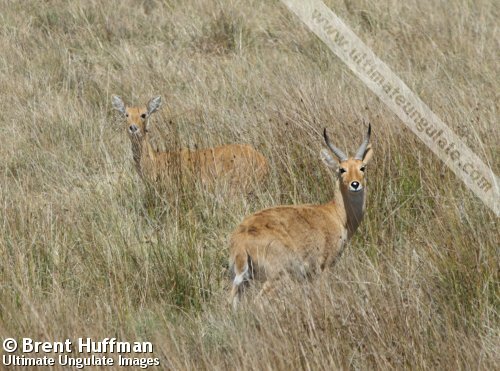 Population densities in East Africa are typically 10�21 reedbuck per km2 although in Sudan, this may exceed 100/km2 during the dry season when reedbuck concentrate around water sources. Family group: Typically solitary. Two to seven adult females and one mature male occupy a shared home range but rarely associate together for long periods of time. Larger groups may form during the dry season; these may number over a hundred animals in Sudan. Immature males often form bachelor groups. Main Predators: Many large carnivores, including lion, leopard, spotted hyena, African wild dog, and Nile crocodile. 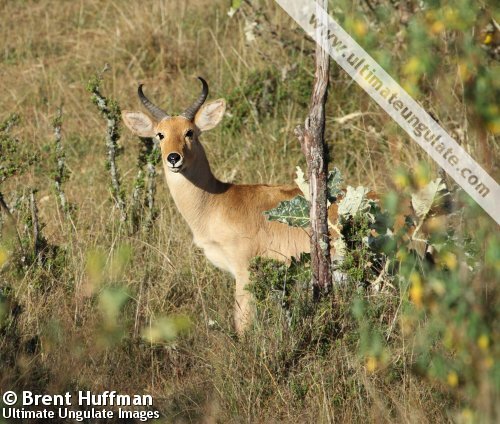 Bohor reedbuck are typically found in floodplain and woodland habitats, with a preference for areas of tall grass near permanent water. They are found in a broad band across Africa from Senegal to Ethiopia, and southwards in East Africa to southern Tanzania. The approximate range is depicted in the map below. IUCN Red List: Least Concern (2008). CITES Listing: Not listed (2011). Threats: Hunting, habitat destruction, and competition with livestock. The estimated total population is 101,000 individuals. An estimated three quarters of this figure are found within protected areas, but population trends continue to show declines, particularly in the western parts of this species' range.